A great tasting complement to the Rocky Mountain Feline Dry, or a standalone diet for your special cat. The combination of animal proteins will provide your cat with ideal protein nutrition for a lean body condition and optimal amino acid nutrition. Vets recommend feeding wet food as part of your cat's diet to lower carbohydrate intake and to increase water intake, both important features in feline nutrition. 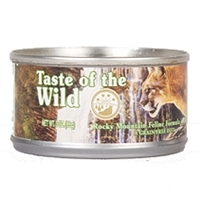 Satisfy your cat's nutritional needs by feeding this Taste of the Wild Rocky Mountain Feline Formula in Gravy along with Rocky Mountain Feline Dry.